We launched a new website for Cover Crops USA at covercropsusa.com. We have been working with The CISCO Company since 2007 and have created several micro sites to serve their product needs. 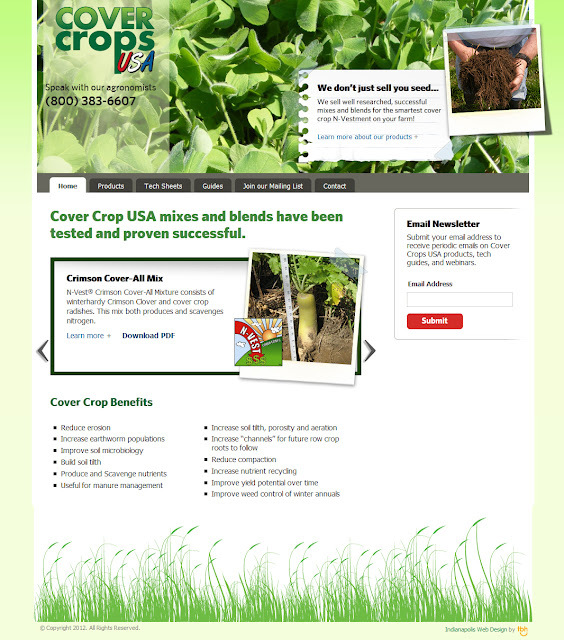 Cover Crops USA is the most recent mini-site we worked on to present their Cover Crops products. We carried the graphic style and general structure into the new design. We used JQuery rotation to present the multiple products on the home page. The CISCO Companies is a full service distributor in Indianapolis, Indiana distributing a wide range of products including seed, lawn and garden supplies, horticulture and agriculture goods. The CISCO Companies recommend using N-Vest cover crops that work well in the Midwest. TBH Creative is an Indianapolis web design company offering full service solutions and web strategies to businesses.